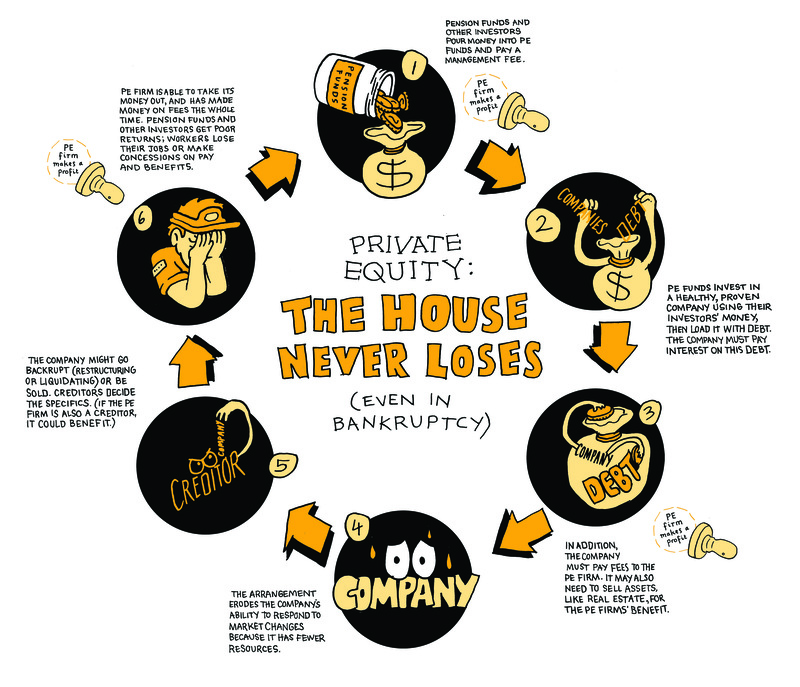 The private equity business model is to strip assets from companies that they acquire. The latest victims: retail grocery chains. Since 2015 seven major grocery chains, employing more than 125,000 workers, have filed for bankruptcy. The media has blamed “disruptors” — low-cost competitors like Walmart and high-end markets like Whole Foods, now owned by Amazon. But the real disruptors in this industry are the private equity (PE) owners who were behind all seven bankruptcies. They have extracted millions from grocery stores in the last five years—funds that could have been used to upgrade stores, enhance products and services, and invest in employee training and higher wages. As with the bankruptcies of common household names like Toys “R” Us, PE owners throw companies they own into unsustainable debt in order to capture high returns for themselves and their investors. If the company they have starved of resources goes broke, they’ve already made their bundle. This is all perfectly legal. It should not be. The media has blamed "disruptors" like Walmart, Whole Foods, and Amazon for grocery store bankruptcies. But the real disruptors in this industry are the private equity owners. The bankrupted PE-owned grocery chains include East Coast chains A&P/Pathmark, Fairway, and Tops; West Coast chains Fresh & Easy and Haggen; the Southeastern Grocers chains (BI-LO, Bruno’s, Winn-Dixie, Fresco y Más, and Harveys); and in the Midwest, Marsh Supermarkets. We could find no comparable publicly traded grocery chains that went bankrupt during this period. The future of regional supermarket chains is a major concern for consumers, vendors, local communities, workers, and their unions. Grocery workers are by far the most unionized of all retail workers. The United Food and Commercial Workers International Union (UFCW) has 1.3 million members in the United States and Canada, with 60 percent working in supermarkets and another 15 percent employed in meatpacking and food processing. Most UFCW members (two-thirds) are employed by the top five supermarket chains, with Kroger and PE-owned Albertsons/Safeway clocking in at first and second respectively in market share and accounting for the lion’s share of unionized supermarket workers. Private equity firms, famously, have no commitment to the long-term sustainability of the companies they buy; their time horizon is three to five years until, ideally, they exit these investments. The heart of private equity&apos;s business model is the “leveraged buyout” (LBO). This is a deal in which a PE fund uses capital supplied by pension funds, endowments, wealthy individuals, and other investors as a down payment, and buys out a company using high levels of debt that it loads on the company — typically in the range of 70 percent of the purchase price. Post-buyout, PE firms often add on more debt in order to pay themselves a dividend, or they sell off assets or real estate, reducing financial stability. Strangled by debt and newly obligated to pay rent, these grocery chains have neither the ability to cut prices to compete with low-cost chains nor the resources to invest and compete with upscale markets. And in an industry like grocery, where profit margins are thin, a small drop in revenue may undermine a PE-owned supermarket’s ability to keep up with interest payments on the debt. See the full business model illustration here. To skip ahead to the next section, click here. 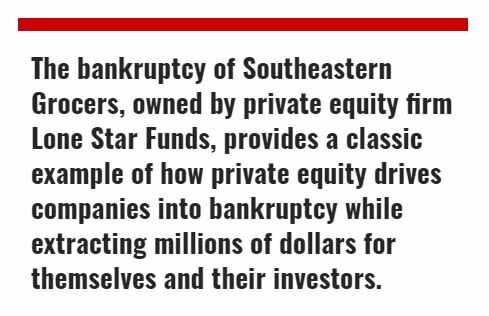 The bankruptcy of Southeastern Grocers, owned by PE firm Lone Star Funds, provides a classic example of how private equity drives companies into bankruptcy while extracting millions of dollars for themselves and their investors. Southeastern is the owner of well-known brands BI-LO, Fresco y Más, Harveys, and Winn-Dixie, located in seven southeastern states. While all supermarket chains face intense competition and thin profit margins, Southeastern’s regional competitors, such as Publix Super Markets, have survived and flourished. Lone Star first bought out Southeastern’s predecessor, BI-LO, in 2005 in a leveraged buyout, and took the company private. It ran the company into bankruptcy by 2009 and emerged from Chapter 11 in 2010. It tried to sell the chain to publicly traded Kroger and employee-owned Publix Super Markets, but they were not interested. After six years of ownership, Lone Star was overdue in paying promised outsized returns to its investors. So it executed a “dividend recapitalization” — meaning that it loaded the company with even more debt to pay dividends to itself and its investors. Between 2011 and 2013, it paid itself and its investors $839 million in dividends — money that could have been used to make stores more competitive. The struggling company became saddled with interest payments. One loan of $475 million, used to pay dividends of $458 million to Lone Star, required Southeastern’s BI-LO to pay $205 million in interest between 2014 and 2018. Lone Star’s owner, John Grayken, is a billionaire who famously renounced his US citizenship to avoid paying taxes. To offset the growing debt due to dividends and LBOs, the company sold the real estate of a distribution center for $100 million and several stores for $45 million, and then required the affected entities to pay rent on the buildings they used to own — further undermining their financial stability — referred to in financial parlance as a “sale/leaseback.” In need of more cash, Lone Star secured a series of revolving credit loans and debt financings between 2014 and 2017. In the meantime, between 2011 and 2018, Lone Star took out a total of $980 million in dividends from Southeastern Grocers, according to Moody’s Investors Service. By March 2018, Southeastern filed a “pre-packaged” Chapter 11 bankruptcy. Once used for unique situations, PE firms now treat them as a staple in their bankruptcy proceedings, allowing the PE owners to fast-track the process by working out a deal with senior creditors before the bankruptcy filing. Unsecured creditors — mainly vendors, suppliers, and workers who are owed back wages, vacation pay, health insurance, and other payments — have little time to respond and are often left out in the cold. When the company exited bankruptcy in June 2018, about 2,000 workers had already lost their jobs. The deal reduced debt from about $1.1 billion to $600 million, with creditors swapping debt for equity and the company agreeing to close 94 stores, affecting thousands more workers’ jobs. This all too familiar story is not about “disruptive” new competitors or price wars — it is about private equity extracting wealth and driving companies into bankruptcy. The same playbook drove Tops Markets into bankruptcy only a month before Southeastern Grocers. 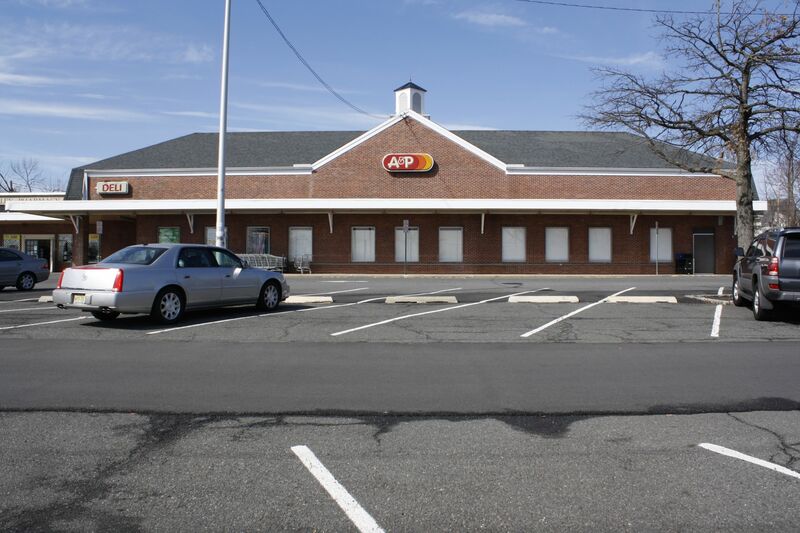 The northeastern chain of 170 grocery stores was bought out by Morgan Stanley Private Equity and Graycliff Partners in an LBO worth $310 million in 2007. Morgan Stanley pursued a number of LBO add-ons between 2007 and 2012, and then financed the buyout of the company, including all of its debt, by Tops management in December 2013. By that time, Morgan Stanley had loaded the company with $724 million in debt — more than twice the original purchase price. That included some $377 million in dividends that Morgan Stanley paid to itself and its investors — equal to 55 percent of the total debt that had accrued. This does not include advisory fees charged by Morgan Stanley nor the future interest payments that Tops had to shoulder. As in the case of Southeastern Grocers, the debt overhang left Tops with little wiggle room to reduce prices or resources to invest in store upgrades, new products, and online services needed to be competitive, as it reported itself in its bankruptcy filing. At the time of the bankruptcy, it had 14,800 employees, with 12,000 represented by UFCW and 700 by the Teamsters. The company used the bankruptcy process to substantially reduce the pension benefits for members of both unions by withdrawing from the unions’ defined-benefit pension plans and replacing them with 401(k) plans. In January 2018, the S&P Global Ratings agency downgraded Tops’s credit rating from CCC+ to CCC, eight levels below investment grade. In August, one day before it announced its plans for emerging from bankruptcy, the company closed ten stores. 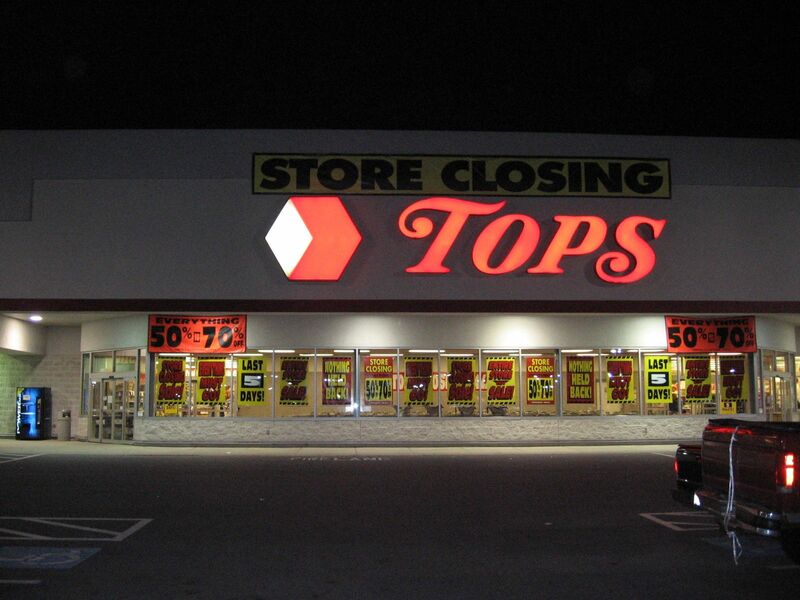 The bankruptcy plan will reduce Tops’s debt from $700 million to $435 million, and its interest payments from $80 million a year to about $36 million. Fairway Market, a small chain of upscale specialty grocery stores mostly in Manhattan, faced a similar struggle for survival. Acquired by PE firm Sterling Investment Partners for $150 million in an LBO in January 2007, the grocery chain found itself with $100 million in debt — a very high debt load for a small company in the cyclical grocery industry. But its PE owners weren’t done loading Fairway with debt. Five further rounds of debt financing occurred between December 2009 and December 2012, including a leveraged recapitalization in January 2010 to pay down some of the chain’s existing debt and to finance the purchase of additional stores. Industry observers characterized the expansion as “aggressive and miscalculated.” The chain grew to 15 locations in the New York City area. In April 2013, Sterling returned Fairway to the public markets via an initial public offering (stock sale), but retained a large portion of the stock, giving it control of about 80 percent of the voting power in the chain. Fairway’s shares sold at $13 a share, above its expected range of $10 to $12. The IPO raised $177.5 million, most of which ostensibly went to the chain; only $3.2 million went directly to its PE owners. However, the chain used the proceeds from the IPO to pay affiliates of Sterling Investment Partners $76.8 million in accrued dividends on their preferred stock, $9.2 million in connection with the termination of the monitoring fee agreement, and $8.1 million in bonuses to certain members of the management team. So Sterling and its investors extracted even more money from the actual grocery operation. In sharp contrast to bankruptcies in other PE-owned businesses, Fairway pledged to respect collective-bargaining agreements with its 3,400 unionized workers — 85 percent of its employees — who were primarily represented by UFCW. 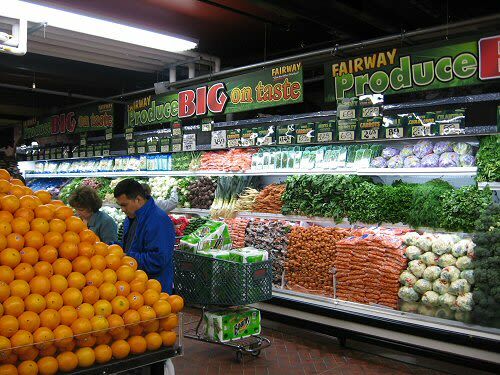 Fairway’s legacy of positive labor–management relations and investment in human resources management practices predates its acquisition by Sterling Investment Partners. It had traditionally hired a full-time workforce and provided workers with employer-sponsored health insurance and a defined-benefit pension plan. Management attributed the chain’s ability to cater to its high-end clientele to the quality of its customer service. Remarkably, the PE owners left this in place even as the company sank into bankruptcy — but the creditors absorbed the losses. In July 2016, a couple of months after seeking Chapter 11 protection, Fairway was bought out of bankruptcy by GSO Capital Partners (a unit of PE giant Blackstone Group) and a consortium of Wall Street investors through yet another LBO for an undisclosed amount of money and debt. As the cycle of added debt and bankruptcy continues, worker pay could well be next. Private equity has a wide range of financial engineering tools at its disposal, depending on the particular conditions of each company. In the case of Marsh Supermarkets, private equity cashed in on its rich real estate before throwing it into bankruptcy. The PE buyout dates to 2006, when the Indianapolis-based company with 116 groceries and 154 convenience stores was up for sale due to losses it incurred during the “grocery wars” of 2005. Prospective buyers were thin until a footnote in one of the company’s financial reports showed that Marsh’s real estate was worth $100 million to $150 million more than listed on its financial statements. In September 2006, Sun Capital Partners took Marsh private in an LBO. Soon after it acquired the chain, Sun did a sale-leaseback deal for the real estate of many of Marsh’s stores, raising tens of millions of dollars for itself and obligating the supermarket stores to pay rent on locations they had previously owned. Sun also sold Marsh’s headquarters building and saddled the grocery company with a 20-year lease to 2026 at an annual rent of $2.8 million, scheduled to increase 7 percent five years later. In 2017, with just 44 stores remaining, Marsh went bankrupt. A sale-leaseback deal, coupled with PE mismanagement, did in the Haggen supermarket chain as well. In September 2015, Haggen entered bankruptcy; thousands of workers were affected. 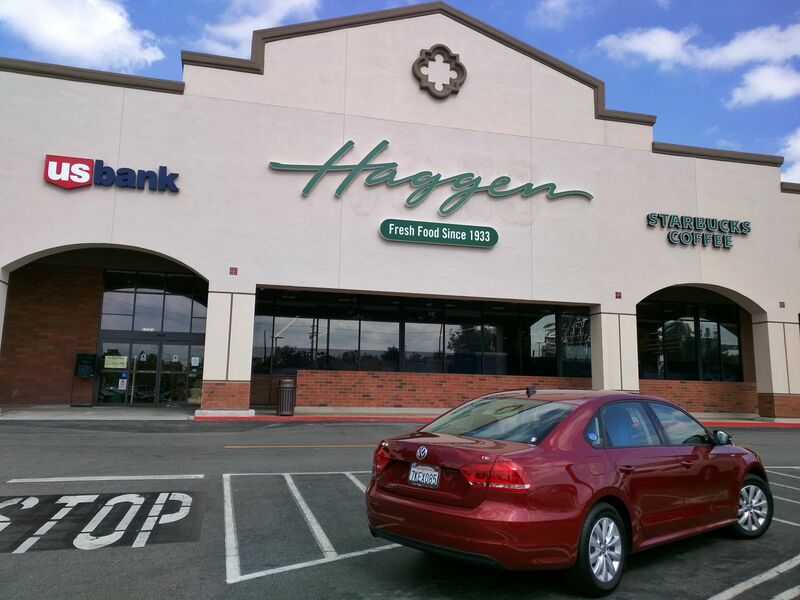 Comvest Partners bought out Haggen, a chain of 30 stores, in an LBO in 2011. It soon sold or closed 12 stores. In December 2014, it agreed to acquired 146 stores for $309 million from Albertsons, which needed to divest them to satisfy antitrust concerns related to its takeover of Safeway. With a nine-fold increase in the number of stores it owned, Haggen struggled to manage the transition. By the summer of 2015, customers were complaining about higher prices in the stores. Supermarket analyst David Livingston of DJL Research noted at the time, “They were just clueless from the very beginning. … You couldn’t do worse than what they’re doing.” Eight months later, in September 2015, Haggen filed for Chapter 11 bankruptcy. The company closed, sold, or auctioned off its 164 stores, with 29 of them going to Albertsons. Workers, vendors, suppliers, and landlords were losers in this story, but not Comvest. Many of the 146 stores acquired from Albertsons came with valuable real estate and most were operating in the black, according to documents obtained by The Seattle Times. At the time that the PE firm agreed to buy the 146 stores, securities filings show it also reached a deal to sell the real estate underlying 20 of the new store locations for $224 million — and lease them back under a sale-leaseback agreement. It later engaged in sale-leaseback transactions for additional stores for a total of 39 stores. Through these sales, Haggen made an estimated total of $300 million according to regulatory filings and real-estate documents — roughly equal to what it paid for the 146 stores. The unsecured creditors meanwhile — mainly laid-off workers, suppliers, and landlords — were owed roughly $100 million. In September 2016, they sued Comvest, alleging that the company had siphoned off the real-estate assets to its benefit, undermining the stores’ financial stability. In their complaint, the creditors alleged that “the massive and inflated rental obligations incurred by the [operating companies] contributed directly to their rapid collapse.” But the creditors lost — the bankruptcy court ruled that they had failed to establish gross negligence, self-dealing, or fraudulent transfers. This is an astonishing free pass for what most lay observers would consider self-dealing, and an invitation for Congress to act to curtail what has become a template of abuses. Fresh & Easy is yet another example of a case in which a PE firm used the real-estate assets of a company it controlled to enrich itself. 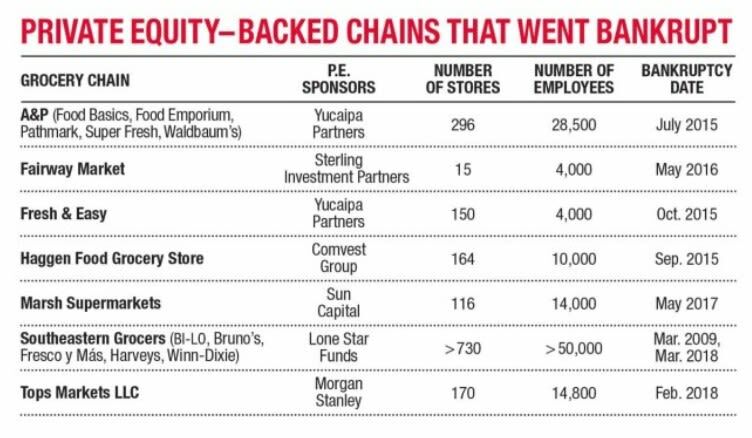 In November 2013, Yucaipa, Ron Burkle’s PE firm, bought 150 stores employing 4,000 workers from the bankrupt supermarket chain Fresh & Easy. On October 30, 2015, Fresh & Easy filed for Chapter 11 bankruptcy. Unable to get the financing it needed to continue operating while in bankruptcy, Yucaipa began the process of liquidating the business. Across three states, 3,000 employees were thrown out of work. Despite the bankruptcy, Burkle and Yucaipa had plans in place to profit using Fresh & Easy’s real estate — a plan he had put in place in April 2014, six months after acquiring the chain. As part of the bankruptcy process, the bankruptcy court appointed a Committee of Unsecured Creditors, made up of vendors and other suppliers owed money by the now-defunct grocery chain. In its informal investigation of events at Fresh & Easy, the committee determined that Yucaipa and Burkle had transferred 19 Fresh & Easy stores with a real-estate value of at least $40 million to themselves via a real-estate holding company they controlled. These stores were no longer available to satisfy the debt owed to the vendors. The committee wanted to prevent any further real-estate transfers. 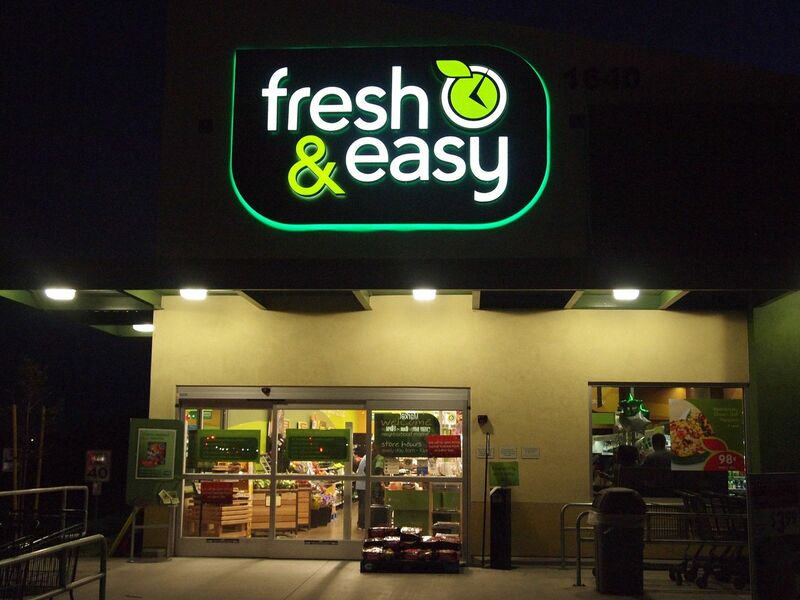 When Yucaipa and the real-estate company declined to agree not to transfer other Fresh & Easy stores, the committee asked the bankruptcy court for a temporary restraining order. The bankruptcy judge agreed with the committee’s concerns and issued the order on May 31, 2016. What&apos;s Next for Sustainable Jobs in the Grocery Sector? Grocery chains employ 2.8 million workers, distributed in small towns and cities across the country. They still account for the majority of food-at-home purchases and are an important source of jobs in local communities. Their continued presence is important to the local economy and to a sense of community in the neighborhoods they serve. 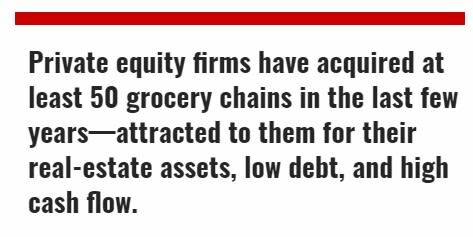 PE firms have acquired at least 50 grocery chains in the last few years — attracted to them for their real-estate assets, low debt, and high cash flow. Their strategy of buying, selling, and flipping stores undermines the economic security of workers and the stability of local communities. 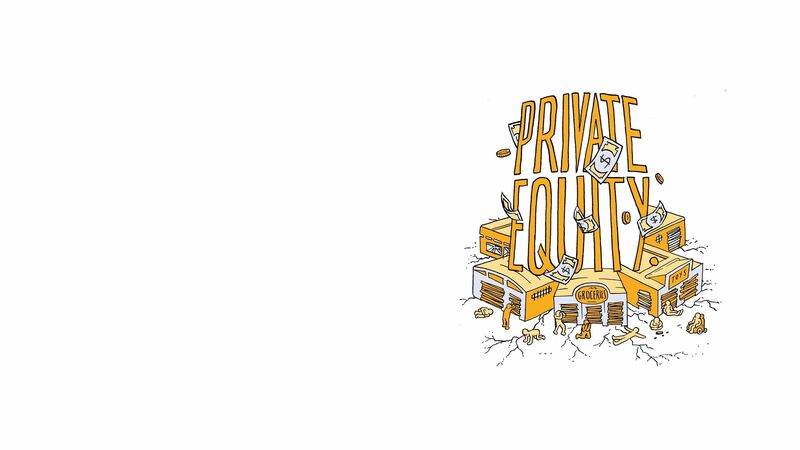 Private equity can assemble the resources needed to invest in facility upgrades, technology, worker skills, and product and service innovations to help supermarkets remain competitive. But their core business model requires these funds to be extracted rather than reinvested. Kroger and Albertsons — the numbers one and two supermarket chains in the country — provide a useful comparison. Kroger is conventionally owned. Albertsons is held by private equity. Kroger is about twice the size of Albertsons — with $105 billion in sales in 2017 compared to Albertsons’ $60 billion. But both are huge, successful corporations with locations in 35 states each. Kroger operates under 26 banners (including Dillons, Food 4 Less, Fred Meyer, King Soopers, Ralphs, City Market, QFC, Owen’s, Pay-Less, and Smith’s) in 2,782 supermarkets and 2,268 in-store pharmacies, plus 1,489 fuel centers and 42 distribution centers, according to its 2017 Fact Book. Albertsons operates under 20 well-known brands — including Albertsons, Safeway, Shaw’s, Acme, Vons, Jewel-Osco, United Supermarkets, Market Street, Star Market, and Haggen. Its 2,318 supermarkets include 1,777 pharmacies, 1,275 in-store coffee shops, and 397 adjacent fuel centers, according to its website. Both report that they have robust sales of their own private-label brands, with Kroger owning 37 manufacturing plants and Albertsons 20. Both have developed organic and healthy food lines and both have acquired a “meal kit” services company (Home Chef for Kroger and Plated for Albertsons). Moreover, both are majority-unionized — Kroger with 449,000 full- and part-time workers, and Albertsons with 280,000 —with workers in each chain represented by the same unions, primarily UFCW and the Teamsters. The big difference is Albertsons’s PE ownership and history of leveraged buyouts that has burdened the supermarket chain with a debt overhang of $12 billion since its buyout of Safeway in January 2015. This constrains its ability to lower prices or innovate to compete against Amazon’s Whole Foods, Walmart, or Kroger. Compared with other grocery chains, Albertsons has more than twice the net debt-to-earnings ratio — 4.74, compared with Kroger’s 2.13, Sprouts Farmers Market’s 1.44, and Publix’s 0.35. After Albertsons’s failed IPO in the fall of 2015, its financial performance declined: operating income fell substantially between 2016 and 2018, and bond investors assigned higher levels of risk for the company’s bonds during 2017, and the S&P Global Ratings revised its outlook on Albertsons to negative in November 2017. Critics pointed to the downside risks of the merger, which they viewed as one of desperation — two weak companies becoming one larger weak company. Rite-Aid and Albertsons called off their planned merger on the eve of the vote because of growing opposition from Rite-Aid shareholders. Some of the largest had announced plans to vote against it, jeopardizing its success. Cerberus’s next move and Albertsons’ future are uncertain. Albertsons’ debt-weakened state has undermined its PE owners’ attempts at a speedy and profitable exit. Will they now turn to asset sales to pull cash out and reward themselves, without regard to the poor prospects this will create for Albertsons, its 280,000 workers, and the hundreds of communities the stores serve? Or will they postpone plans to exit their ownership of Albertsons and increase their equity investment in the supermarket chain? 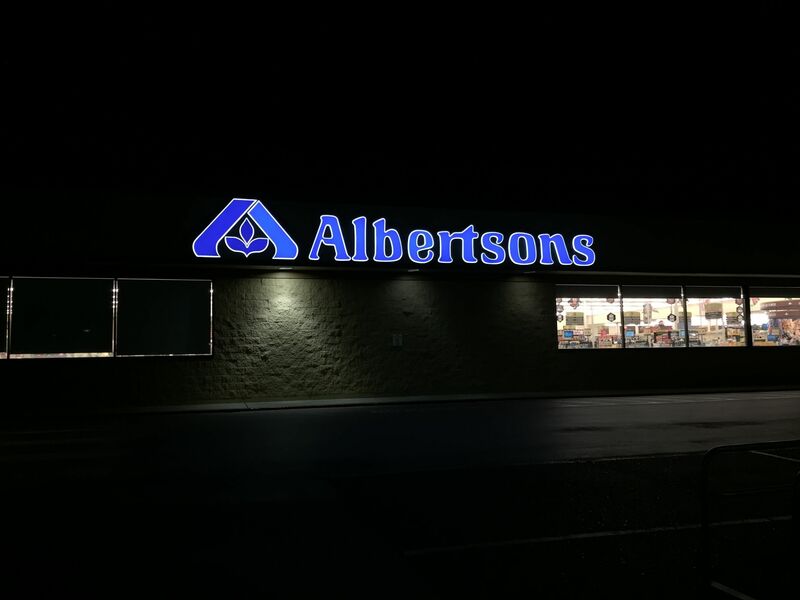 Such an infusion of cash would enable Albertsons, after years of underinvestment in its stores, to make meaningful improvements in its operations. The answer may hinge on what public pension funds do. These funds have increasingly invested in private equity, despite its unsavory and anti-worker practices, lured by the promise — if often not the reality — of higher returns. The question of whether the big pension funds should avoid private equity or use their investment to reform its practices has been hotly debated. (Pension funds cling to the hope of high yields despite the reality that half the PE funds launched since 2006 have not beaten the stock market and many more have failed to provide returns high enough to compensate for the added risk of these illiquid investments.) 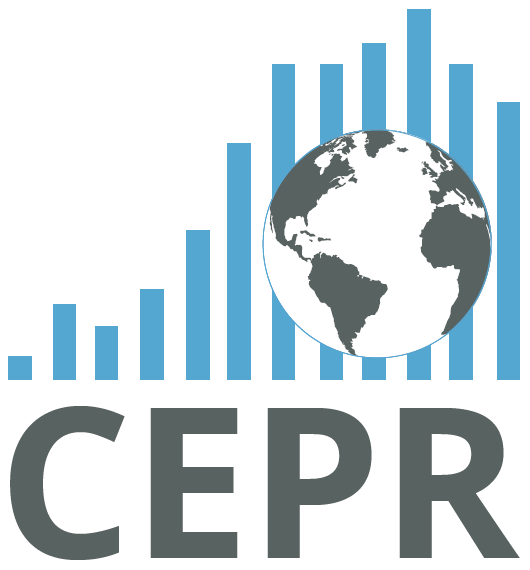 The California Public Employees’ Retirement System (CalPERS) has a large stake in Albertsons via its investment in the Cerberus fund that owns the supermarket chain. Will CalPERS, which has responsibility for managing the retirement savings of California public-sector workers, many of whom live in communities served by supermarkets Albertsons owns, insist that Cerberus abandon attempts at a quick exit, extend the time they are willing to hold the grocery chain, and commit to making investments that will improve store operations and increase profits? In the meantime, Albertsons’ competitor, Kroger, is in a far different competitive position. The June 2018 Moody’s credit opinion of Kroger noted its large scale and strong balance sheet as key credit drivers. According to its 2017 Fact Book, Kroger’s debt strategy is to maintain a low net total debt-to-earnings ratio of between 2.3 and 2.5. 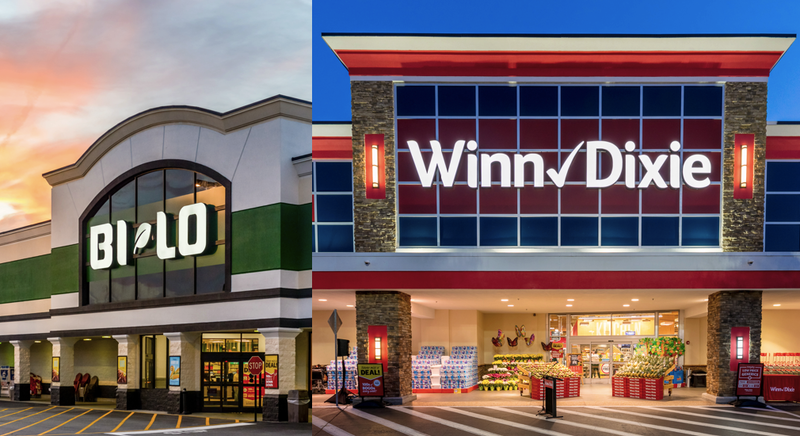 Between 2015 and 2017, it invested roughly $3 billion each year in existing stores and operations, and it plans similar levels of capital investment in existing facilities for the 2018–2020 period. This is part of its “Restock Kroger” program, announced in October 2017, that includes the substantial renovation of its 2,800 supermarkets, expansion of partnerships to provide additional services, and investment in workforce development. It will use free cash flow to invest $9 billion in these projects to enhance the use of customer data, to optimize space allocation, and to upgrade technology and infrastructure for faster checkout, digital displays, video analytics, machine learning, and online shopping. Investments will include funds for employee training and development as well as $500 million to incrementally raise wages of associates over the three-year period. It has already launched its own new apparel line, is piloting a driverless vehicle for home delivery, and has formed a new partnership with the leading online supermarket service, Ocado, to build 20 new automated distribution centers at an estimated cost of $400 million to build in the next three to five years. Leading Wall Street analysts cite these strengths, plus Kroger’s unexpectedly strong earnings report for the first quarter of 2018, as evidence that the company can survive Amazon’s threat. Kroger’s digital sales grew by 66 percent in the first quarter of 2018. The Wall Street Journal cited Kroger’s “aggressive” strategies on many fronts as evidence it will remain an industry leader. It also noted that Kroger is increasing wages and benefits for its workers and is investing a billion dollars to shore up pension liabilities. The pension contribution is unusual for the grocery industry and contrasts sharply with Albertsons’ behavior. Kroger may see this pension contribution as a key investment in its workforce and in its efforts to respond to new competition. 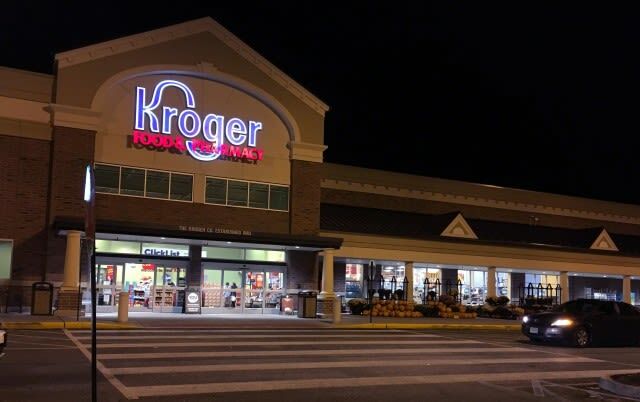 According to the Journal, the company’s “strategy is paying off.” For Kroger’s workers, the future looks bright. PE owners have turned this model on its head — loading the supermarket chains they own with huge debt burdens intended to boost returns to themselves and their investors and, frequently, selling off real-estate assets in sale-leaseback arrangements to lower debt and line the PE firm’s pockets. In stable market conditions, this is a winning strategy for PE owners. 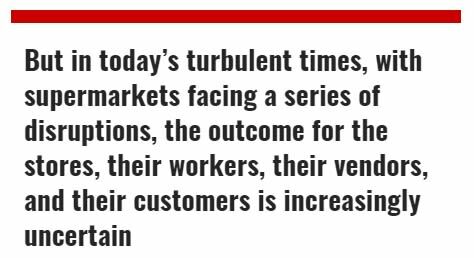 But in today’s turbulent times, with supermarkets facing a series of disruptions, the outcome for the stores, their workers, their vendors, and their customers is increasingly uncertain — and the specter of bankruptcy omnipresent. Public policies can reduce incentives for the types of financial engineering by PE firms that drove these grocery chains into bankruptcy. First, in a joint letter, major federal bank regulatory agencies have issued guidance to banks to limit the debt they load onto companies to no more than six times EBITDA (earnings before interest, taxes, depreciation, and amortization). A debt higher than this, in the view of these regulators, puts a company at too high a risk of bankruptcy. Legislation that limits the amount of debt that can be levered onto a company from all sources, not just banks, would reduce the possibility that a company will fail because it is strangled by debt. Recent changes to accounting standards now require companies to report lease agreements along with outstanding debt in their financial reports. Rent payments on leases, like interest payments on debt, can threaten a company’s solvency and its continued operation. Lease obligations should be taken into account by lenders when considering how large a loan to make to a company. Second, PE firms could be precluded from requiring companies they acquire to pay them dividends in the first two years following the LBO — similar to a rule for PE firms in Europe under the Alternative Investment Fund Managers Directive. These resources, according to the directive, should be available to the company to use to improve its operational performance. This will benefit its employees and other stakeholders, including the pension funds that have invested in it. Third, PE firms should be required to reveal to pension funds and other investors the full extent of the fees they collect. This includes the management fees and expenses investors pay the firm; the 20 percent share of any profits that the PE firm typically receives — pay for performance referred to as “carried interest” and taxed at a favorable rate; and the monitoring and transaction fees the PE firm collects directly from the companies it owns. California law now requires that public sector pension funds collect information on what they pay to PE firms in management fees, expenses, and carried interest, and make this information available to the public. Monitoring and transaction fees charged by a PE firm directly to the companies acquired by the buyout funds it sponsors should also be reported to PE investors. In the case of public-sector pension funds, all of these fees should be made publicly available. Finally, PE firms need to be treated as the owners that they are. But the courts for the most part treat those firms as passive investors. This lets private equity off the hook when companies they own engage in wage theft or subject employees to unsafe working conditions. The multiple abuses by PE firms exist only because of loopholes in the law. That can and should be reformed. Eileen Appelbaum is Co-Director at the Center for Economic and Policy Research. This article draws on her book with Rosemary Batt, Private Equity at Work: When Wall Street Manages Main Street. A version of this article appears in The American Prospect, Prospect.org, Fall 2018. Used with permission.